My rats enjoy a good game of chase and pounce. It involves taking a pencil, ribbon or similar object and wiggling it around til it catches thier eye, then once they try to go for it keep dragging it along the ground. 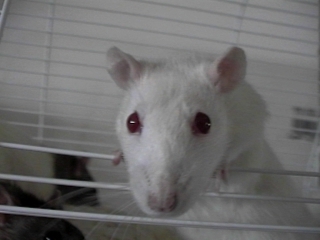 My rats will chase the end of the pencil all over the room. This also works with trailing shoelaces. My rats chase me all over the house endlessly if my shoes are untied. I've had up to 7 rats at a time following one string. It's really cute to see. Ty's (and sometimes Bess's) favorite game involves chasing a piece of paper (the label off a pill bottle, actually, tape included) as I pull it across the bars of their cage. It sounds like a bicycle with a card in the wheel's spokes. Ty will chase this thing until my arm wears out. Sometimes she even catches it. She has terrible eyesight (weave weave all the time), so I think she appreciates a "noisy" game. Bess (left) is enjoying a good scratch while Ty is weaving to get a better look at things. Several years ago Al and I had two ratgirls, Abigail and Cecelia, who loved to have someone blow air gently in their faces. They were fascinated by a gentle stream or intermittent puffs. Swaying their heads, they would get closer and closer to us, then try and investigate our mouths, the source of the air. They never got tired of this game, although we sometimes got tired of playing it with them and never let them find the secret source inside our mouths ("Off limits, girls!"). While strong sudden bursts of air, or raspberries in their faces, can be quite startling to rats, a softer stream of air can become a game, as we found with Abigail and Cecelia. You can also play the blowing game through the cage wires, and blow a bit harder. (It is far safer for you to play this only through cage wires...) The rats try frantically to catch the air with their hands (with their ears folded back & eyes squeezed shut), trying at the same time to shove away other rats trying to play the same game. I get dizzy long before the rats get bored of this game. Then there's the opposite form of the blowing game. We've found out that most of our rats like this game: put the vacuum cleaner on LOW, take the mouth-piece off and put the end of the tube on the cage (Note: there are rats who do NOT like this game, stop immediately if your rat acts scared!!!). Our rats love to put their noses into the vacuum cleaner's tube (safely through the cage wires) and have their whiskers "vacuumed in". I have no idea what is so fun with the vacuum cleaner game, but then again, many rat games seem to make absolutely no sense. Tag, flipping, wrestling are good games because they're all in the range of normal rattie behavior. If you watch them playfight, they chase each other, the one who runs will decide to turn the tables and become the "attacker" all of a sudden, etc. 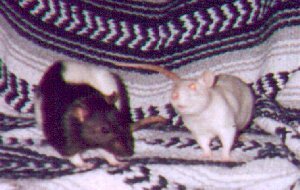 Tristen's rat Tiu (right) enjoys chasing hands. If you tickle her back, she'll "attack". Another easy game is if your rat likes to crawl on you, pick him up and gently toss him a couple of feet away, onto something soft like a bed or sofa. Chances are he'll come back for more, they think this is a fun ride. Tiu (left) is wearing her hamster harness. When she's outside the leash makes it easy to find her if she tries to hide. It also makes it easy to pull her to safety if a larger animal shows up. One of our rats likes the ribbon game. We dangle a hair ribbon into her cage and she grabs and pulls on it. Sometimes we pull back on it for tug-o-war and sometimes we let her pull it most of the way into the cage, then catch the end before it goes in. We put the new end into the cage, so she pulls that in, and then we catch the other end, etc. The funniest part is when she's pulling on one end and standing on the other and can't figure out why the ribbon won't budge. My very bright little boys, Buzz and Woody, have come up with a game they enjoy. I dangle the end of an 18" piece of rope, with several knots in it, between the wires in the top of their cage. 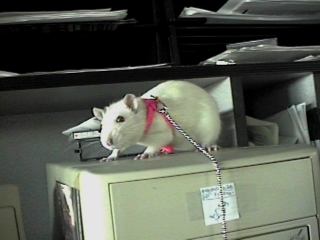 They grab the rope as it goes past and tug on it with all their little rattie strength. The fun part for me is dangling both ends in, while keeping the rope looped over a bar. They each grab an end and play tug-o-war with each other. Since their weights are evenly matched, it goes on for quite a while. I have an old quilt that goes over the bed when Pernie's there. I poke at him gently from underneath the quilt and he goes wild trying to catch my hand. Pernie unties my shoes when he wants to play this one. I lift my foot up and he tugs, chews, and climbs up the laces. You haven't lived until you've had a rat dangling from your shoelaces. I have a mylar helium balloon tied to the end of my couch, and last night Pernie discovered the ribbon. He started pulling at it with his mouth, then with his little paws. Soon he was pulling the balloon down, hand over hand (paw over paw?) by the ribbon. When the balloon got to his nose, he'd let go of the ribbon to make a grab at the balloon, which floated out of his reach -- then he'd start the whole thing over again. He kept at it for about fifteen minutes, and went back to it periodically all evening. I don't know who had the better time, Pernie pulling or me watching! Tara and Gene like to hide under the bed with me on the floor a few feet away (holding a bowl of cheerios). Periodically, they will scoot out up onto my lap and we play tug-of-war with a cheerio for a while. Then, when they 'win' it, they scoot off under the bed again. Variations include having to find the cheerio inside my sleeve or up on my shoulder. It's also a handy game to play when they need to go back in the rathouse because they come out to play the game when I rattle the cheerio bowl! My rats Norton and Menew love to play "hide and seek",heres how to play: Get a big pile of blankets,mess it all up,and give your rat some time to hide. Then try and find him without disrupting the pile of blankets.Try and time him or her and compare the times from time to time. He or she will become an expert in no time. I have a game my little rattie Jello loves to play. I place her on a made bed and call her to come over to one corner of the bed. When she is about halfway there, I duck under the bed. She loves to try and find me. Somtimes I will leave a foot sticking out as a clue to where I am. My 12 ratties LOVE to play "Coin Wrapper Surprise." I take a paper coin wrapper of any size (the bigger the better, however) and stuff bread or raw pasta in it, close one end all the way, close the other end very loosely or not at all, throw it to my ratties and they GO NUTS trying to grab it and open it and carry it around and steal it from whoever has it already and, well, it goes on for ages until all the stuffed-in food comes out and they have a ratty feast! What I do is have food hunt games. Take a sorbet container & clean it. (You can leave some sorbet in it,the rats will clean the inside for you.) Get a footie or small sock, stuff food in it, shove it in the sorbet container. First time,don't put the lid on. Watch as they try to get into the sock. Phase 2,put the lid on & make a small hole so they can just get their heads in. Now, they will have to enlarge the hole before they can get to the sock inside. You can also take a toilet paper roll, stuff the food filled footie inside, put it in a larger box, now they have a 3 part puzzle to solve. Rats catch onto this very fast. If you have a game you'd like add here, describe it as well as you can, and send it to me at audiotre@interlog.com.